Hear fascinating and fun facts about the island's ecosystem that includes the only living coral reef in the continental United States. On a Glass Bottom Boat Day Cruise, you will enjoy ample seating, air-conditioned comfort and an impressive view of various marine inhabitants that populate the waters around Key West. 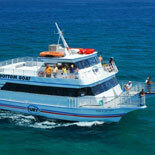 The high-tech, 65-foot catamaran can accommodate up to 110 passengers. In addition to the air-conditioned viewing area staffed by expert guides, the vessel has lavatories, a seated sundeck and snack bar. The Glass Bottom Boat Day Cruise enables passengers to see the exciting undersea world around Key West without donning snorkeling or SCUBA diving gear. This eco-tour is your portal to the island's biologically diverse ecosystem that includes the continental United States' only living coral reef and more than 300 species of tropical fish. During the 14-mile round trip that takes approximately two hours, the captain and crew provide unique insights into this colorful seascape with information and facts about some of the area's most interesting sea creatures. You often could see sea turtles and coral species like Elkhorn and eerie brain. The air-conditioned viewing area of the 65-foot Pride of Key West catamaran provides passengers an up-close look at this vibrant ecosystem. 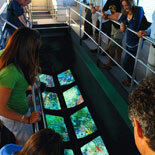 The boat's specially designed "windows to the reef" glass bottom ensures continuous viewing for all guests. The Pride of Key West's stable twin-hull design minimizes the rocking motion that can occur with conventional V-hull vessels. The catamaran also has a snack bar and an open-air sundeck. 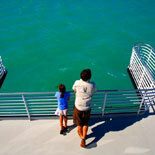 The breathtaking undersea world surrounding Key West awaits passengers on a Glass Bottom Boat Day Cruise. 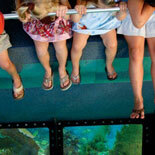 Be captivated by hundreds of species of marine animals and a live coral reef without getting wet. Make your reservations today to obtain an eTicket for this fascinating and fun way to experience Key West's marine ecosystem. Ready to explore the natural beauty of Key West? Boat departs daily. Sails at 12:00pm and 2:00pm. Please arrive 30 min before your departure.